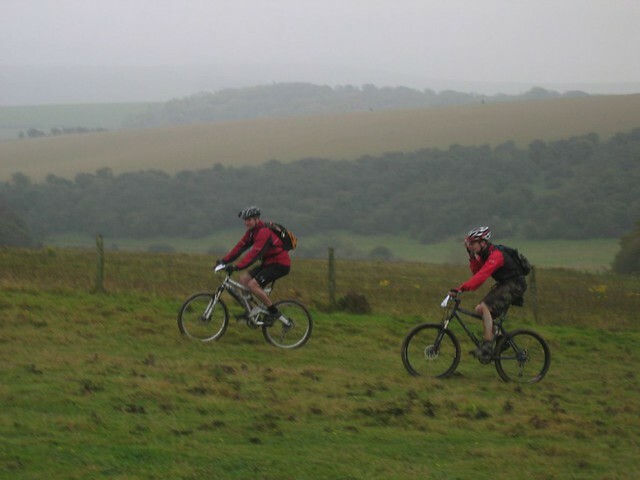 It’s become a tradition that celebrating the date Sussex Muddy@rse was started, October 2006, sees the club returning to the place of its first outing: Stanmer Park, Brighton. This year was no different. We like tradition at Sussex Muddy@rse. Another one we all love is sharing cake and tea at the end the rides. This year was no exception. Spoilt for choice from bakewell sponge, halloween cupcakes, paniata (sp?) Cupcakes with crafty treats inside them, pumpkin pie, just to name a few. We all went home on a high from riding and the sugar. We love birthday parties. We also love riding our bikes. This year Stanmer treated us with glorious sunshine and dry singletrack trails. The happy posse of riders were led through the trees trail after trail by ride leader Jim, aka Captain, who knows this area like the back of his hand. With no waymarking, local knowledge is a must to get around these hills. But a trip onto the Downs’ rolling hills was also up his sleeve and we topped up vitamin d levels. Ditchling Beacon round to Black Cap, and back. The nemesis that is the chalky South Downs Way near Black Cap only collecting one victim this year as tyres lost grip on puddle edge. Whoosh! No warning with wet chalk on the off camber as usual. Back into Stanmer to finish off with a Pear Drop. No, no one was handing round these 1970s sweetie favourites, they’ve been overtaken by Tangfastics; this was the swoopy, droppy, tight, trail that finished off the ride. All the way back down to the car park. 19 glorious miles consumed. Smiling, happy faces delivered. Happy 11th birthday Sussex Muddy@rse. You deserve to still be here for the joy you bring to so many. 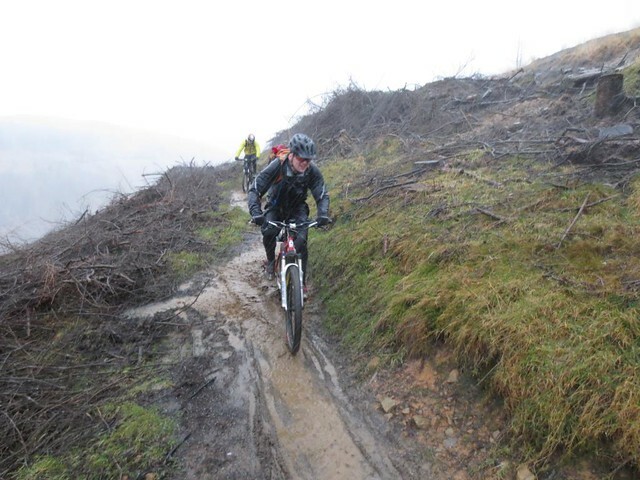 But that wouldn’t be possible without the regular volunteers and helpers who help RichF run it, so riders can turn up every last Sunday of every month and ride some excellent trails, without worrying about getting lost on unfamiliar hills. 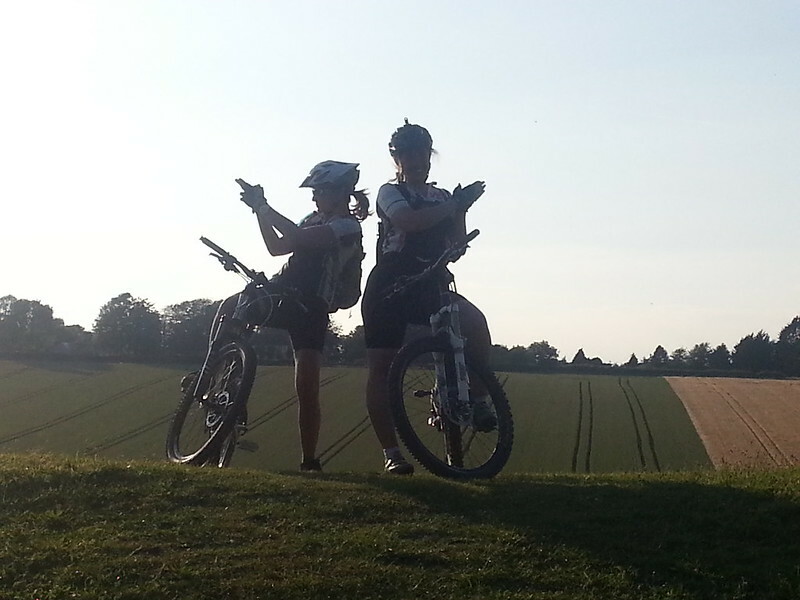 And not getting bored riding the same trails on their own. So, here’s to all of you for helping out, chipping in, baking, gate holding, sweeping, leading, organising, tea making. The club wouldn’t be the fantastic place it is without your input. It was great to ride with you all again after so long away. And great to see the Muddy@rse friendly vibe is still going strong. Long may it continue…hopefully see you on the trails again soon. 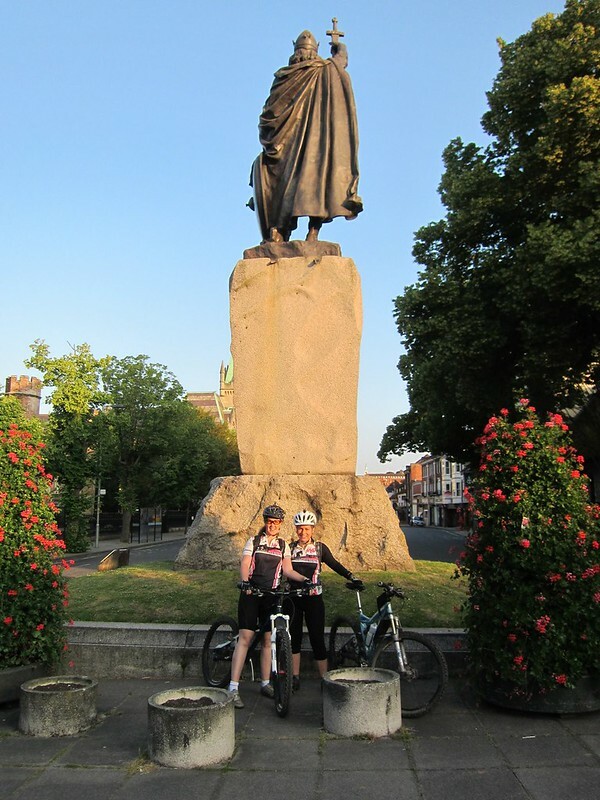 Inspired by Jenn Hill (nee Hopkins), desirous of a new challenge for 2016, we three Muddy @rse regulars: Jo, Sally and Donna, have decided to dedicate this year’s riding to raise money for Macmillan Cancer Support. We’d love it if you’d join in whether by sponsoring us, taking part or hosting other events in aid of Macmillan. Macmillan are an amazing charity supporting people and their families with cancer. Jenn Hill was the Deputy Editor of Singletrack magazine as well as a super-endurance mountain bike athlete and all-round lovely person. Very sadly Jenn died from cancer last year, aged 38, leaving an irreplaceable void in the mountain biking scene. Many people, including Muddy @rse riders, supported Jenn in her last few weeks by posting pictures of their cycling adventures with the hashtag #ForJenn and bought Singletrack mugs, prints and t-shirts to raise funds for Macmillan Cancer Support and Cancer Research UK. We’d like to build on this support by raising £1000 for Macmillan with our mountain biking-related exploits. 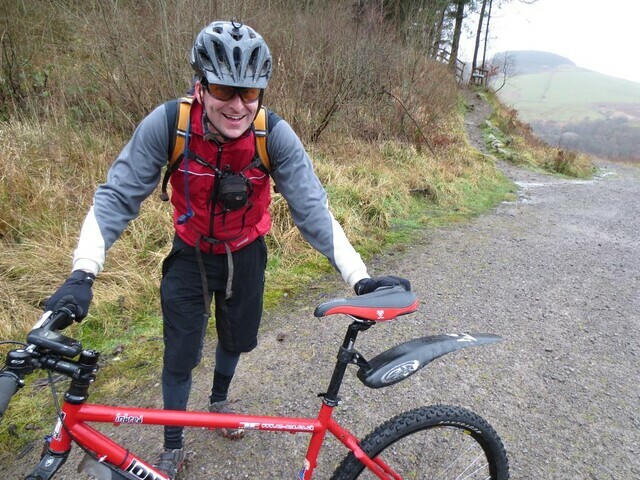 3) Holding a Macmillan afternoon tea somewhere suitably mountain-bike-random, e.g. inbetween the switchbacks on BKB. 4) Hosting a Silent Disco on the South Downs Way. If you are a like-minded @ngel (male or female) and have other ideas that you’d like to host in aid of Macmillan, that would be great! Please start a new thread with your idea and mention Macmillan in the Topic Title or Description. I can then link it from here. EVENT #1 – 28th FEBRUARY 2016 – M@ Cake Sales – Raised £49.72. Excellent start and thank you to all who supported. PAIN, not enough oxygen, leg muscles protesting, heart pounding like a jack hammer, must keep pedalling, keep the bike upright, bloody hell this is hard work and we’ve not even got to New Market Hill yet! Fifteen minutes earlier Team Muddy@rse was standing on a bleak and windswept Ditchling Beacon ready to start the third Cystic Fibrosis Charity Ride. It was the usual eclectic mix of teams out for a nice ride on B.S.O.’s too some very fit people on some serious race spec machinery looking to take the title off team Muddy@rse (not sure looking at Strava the night before checking competitors weekly ride totals was a good thing for my nerves). Lining up for team Muddy@rse was Tez, Timmyb, Steve62, Baby Gixxer (aka Little Rick) and I. Last team to roll as we won last year, no pressure then! We got the go to start and off we went, the pace from the off was relentless, flying across the tops of the Downs trying vainly to hide from a cross/headwind that plagued every team and made you feel so slow. Halfway to the turn down towards the A27 the team got split by of all things and articulated lorry! It trundled slowly along the SDW stirring up all the puddles which then stank. Finally the truck turned into a field and we accelerated again before turning down hill. Again the cursed head wind struck seemingly robbing all speed. We began overtaking teams leap frogging them at gates before a short nasty muddy climb that saw everybody jump off and push. No chance to rest, lungs still heaving, Steve and I really struggled with the fast pace as we pushed up the hill but egging each other on, if we could swear that meant we weren’t pushing hard enough! A quick blast down to the A27 and across the bridge to the horror that is New Market Hill! Steve nearly had a comedy clipped in pedal moment at the first turn but luckily humiliation was averted and up we went, another short muddy push and we were out onto exposed downland. Here we met Team Yellow T-Shirt who were taking things at a more laid back pace and had stopped for a cigarette break! A quick stop to lose a layer and the climbing began. Up ahead Tez and Timmyb looked like they were on a Sunday bimble, apart from the rate at which they were overhauling people up the hill! We slogged up the hill cursing the wind and the hill, getting stretched out with Tez and Timmyb in front with Little Rick bridging the gap back to myself and Steve. Once at the top and after a bit of heckling Steve and I began to recover from the start and we shot across to the concrete road passing another team fixing a puncture, again the wind sapped our speed, being nearly a full minute slower this time compared to last year. A bit of gate management and we were all back together for the Mill Farm DH, roaring down the hill determined to be first, passing a cyclo cross bike I missed him going over the bars as he tried stopping for the gate (no injuries apart from pride). We whizzed along the farm access road and climbed up to cross the Kingston Road when disaster struck! PUNCTURE! Timmyb had a flat rear, Tez dragged Steve on and Rick went to hold a gate. Wheel off, tubleless wasn’t sealing so tyre popped off and checked very carefully to make sure we weren’t going to puncture the new tube. It seemed like every team we had passed was overtaking us! Nothing found so we double checked, fitted the tube, some brisk pumping, refitting and off we went. Collecting Rick just before Itford Hill, sucking on a gel and painfully warming up now cold legs and lungs the pain began anew. Timmyb shot off to catch the lead two leaving Little Rick to haul the Old Dog (me) up his most hated and windswept hill. Every time I got on his back wheel he’d look over his shoulder and with wicked grin accelerate a bit so I’d have to keep up. On this went to the Radio Masts with that thrice cursed headwind making itself felt again as we descended to Bo-Peep passing people all the way with the sun beginning to break through the torn clouds. My heart was saying we’d lost due to the puncture but this is a race so never give up, set a new target, this time sub 2hrs and aim for that. Some slightly deranged calculations from what my Garmin was telling me said that this was possible….just. So with renewed vigour and hitting the vaguely downhill bridleway to Seaford we span as hard as possible, passing more teams and collecting Timmyb before another bout of headwind on the last few exposed fields before picking up the road back to Seaford. Here the evil grin appeared again with a “latch onto me” comment Little Rick was off in Team Time Trial mode. Leading the three of us along the road, head down, lungs heaving, lactic acid coursing through our legs we pedalled for all our worth to the finish where Steve and Tez were waiting. Two hours dead! After a coffee and rest we awaited the results….2nd place. A bit disappointed but vowing to be back on top next year we left to drop Steve back at Ditchling, driving home from there I got a text from Little Rick saying we’d won. After a few more hurried texts it turned out that after checking Strava times and start and finish sheets there’d been a maths error and we were first by 5 minutes! Back again next year, no pressure…………….. Many thanks to Clint and all his helpers for organising a superb event, all the sponsors for prizes and food etc and finally to all the teams from the very fast One Speeders and the other fit teams for keeping us honest to those just out to do a sponsored charity event. Special mention to Mrs Ming for ferrying duties. …….and Team Yellow T-Shirts, three of which were last seen on the Alfriston Road pushing towards Seaford! This is the phrase that popped into my head as I was driving to Wales in late January. After foolishly deciding to take up a challenge from Robin I found myself heading westward towards some proper mountains with the wrong bike packed in the car. A hardtail bike, with only one gear, that tends to only get used to go to the shops or the pub: according to Strava, this bike was ridden for approximately 56km in 2013, 18kms of those were off road. As I drove on towards wales the sky started to blacken. It started to rain somewhere around Swindon it started to rain and by the time I had reached Newport the weather had become a “traditional Welsh winter” of torrential rain and wind. I started to question my sanity but comforted myself in the knowledge that Afan Lodge is dry, has a bar, the food is always good, it has a bar and the company for the weekend would be excellent. Did I mention the bar? It’s got a bar. With Beer. Beer and Whiskey. I drove on. South Wales was somewhere outside the car, hiding in the mist, rain, spray, and wind. Having missed (by luck or judgement) the chance to ride The Wall on a very wet Friday afternoon with the rest of the Muddy@rsers I instead headed up the valley on my trusty On-One Inbred in search of a mobile phone signal. I rode on a cycleway. I got wet. Very, very wet. Signal finally found and home phoned I headed back to the lodge for a change of clothes, a pint of Guinness and a wait in a nice warm bar for the rest of the club riders to return: Singlespeeding is obviously a state of mind and my mind state was soon to be made slightly fuzzy. Beer was drunk, food was consumed. I think the rain stopped at about 10pm. I do remember Robin mentioning that we would be riding W2 on Saturday. Oh, and the weather forecast said it might rain and be a bit windy at some point mid-afternoon. Obviously this would all be a challenge but I felt that if I paced myself I would have a tough, but fun ride with a group of like-minded souls all showing the rest of the mountain bikers with their trick full-sussers and 30 gears just what we could do. Fast forward to halfway through Saturday. A slow climb up the Wall through low cloud and mist, onto the link route past the wind turbines, a fun descent on the Energy Trail and then downhill via the redesigned “Darkside” trail to our lunch stop at Glyncorrwyg had left us all tired but happy. The riding was tough, the climbs were long and I was in no real mood to try and overdo things as we were still in for a serious amount of mountain miles. The first spots of rain had started to fall as we completed the descent and it was starting to get windy too. Having been to Afan previously I have climbed this trail a few times, usually in the summer and I have always enjoyed the way it zig-zags up the mountain through the forest. Unfortunately it now looks totally different, there’s been a lot of tree felling so what was a nice sheltered climb through the tree plantations is now a long, technical, rocky slog up a hill that seems to be exposed at all point to the elements. It was raining hard, the wind was now blowing a full on gale and I was struggling to keep up speed and pace as my front wheel seemed to find every ditch, hole and rock to slow down my progress. The climb became the following : stamp on the pedals, get the bike moving, try and go over a few boulders, try and find a rhythm, the climb steepens, I slow down, stamp on the pedals some more, gasp for breath, scream, hit a water bar/rock, log, etc. come to a sudden, stop, gasp for breath, start again. Then repeat. And repeat. And repeat. My love/hate relationship with my singlespeed had started to re-balance itself firmly in the hate camp. I also realised that I had managed to lose my cycling glasses somewhere on the trail behind me and had also left my sense of humour back in the Skyline café. Finally the trail started to flatten out and I met up with the rest of the group at the start of the Windy Point trail. I was last up the hill and feeling worn out, wet and miserable. Haribo, a few words of encouragement, a very shot stop to catch my breath and everyone headed off for the next trail: Windy Point. The thing about mountain biking is that every now and again you see something truly amazing that completely changes your mood. Ahead of me, Rick called out something like “bloody hell look at that!”. 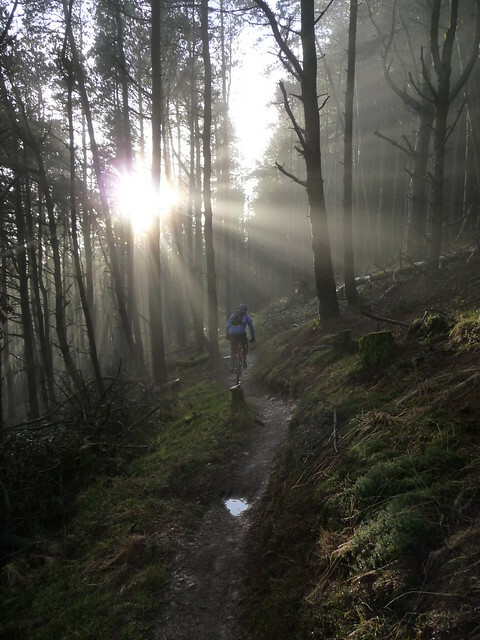 I hadn’t realised that the sky had cleared a bit and the sun was shining low in the sky and suddenly I was threading my way along a perfect, sinuous, narrow trail of forest singletrack with the huge, bright, winter late-afternoon sun shining rays through the mist and trees ahead of me. The forest looked truly, heartbreakingly, beautiful. I had to stop for a moment to take this in. A perfect photo opportunity presented itself. For a moment all the pain of the climb was forgotten. The rest of “The Wall” was ridden, the long technical descent back into the valley made more sketchy by wet trails, fading daylight, a rarely ridden, short-travel hardtail bike piloted by a very tired, aching rider who was looking forwards to a shower, dry clothes, a good meal and a well-stocked bar. Over the last month I’ve looked at the 3 photos that I took of that view at on Windy point, they are pretty good (If I say so myself), hell, I think they are some of the best photos I have taken, but they are also proof that you need to be in the right place at the right time to get that kind of experience and frankly it doesn’t matter if you can’t throw straight. The immortal words used whenever there’s a mention of either an imminent tyre discussion or a suggestion of a delayed arrival at any Muddy@rse ride or event. Its a gentle mickey take, and one of the unique themes that pop up on our very used forum (link over there on the right if you’ve not been here before). There’s also a growing number of silly nicknames (Margaret and GPS are the first examples spotted in the field), repetitive photoshopped pictures (Donna ewok anyone?) and references to oh-so-memorable rides (often, it has to be said, involving riding bikes in sideways rain across an exposed South Down). The everlasting Word Association thread. 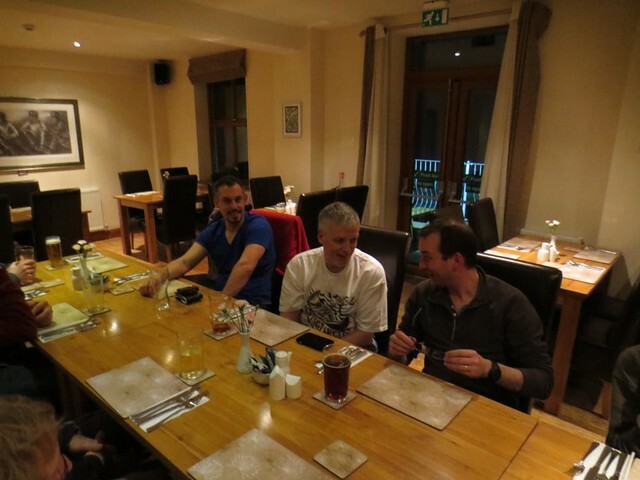 The ever present Tilgate Wednesday night ride thread. The pretty much constant addition of new subject threads, including new names that keep appearing to join the old (and not so old) school. It struck me tonight what a great place our club is right now. A big thank you from me for making it what it is and here’s to many more years of sillines, bikes and muddy@rses.